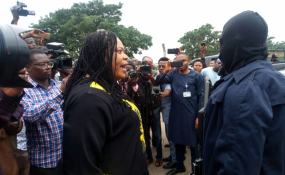 Boma Goodhead from Rivers State confronts the masked men blocking the National Assembly. The brief "unauthorized takeover" of parliament has come amid tensions between President Muhammadu Buhari's ruling APC and main opposition. The opposition labeled the incident an attempted "legislative coup." Police and security forces temporarily blockaded the entrance to Nigeria's parliament on Tuesday, in what the presidency described as rogue action to take over the National Assembly. Osinbajo's office later on Tuesday announced that the head of DSS, Lawal Musa Daura, had been sacked. Saraki, the country's third-highest ranking politician, abandoned the APC and joined the main opposition Peoples Democratic Party (PDP) on the last day before recess on July 24. Atiku Abubakar, a former vice president and PDP presidential hopeful, described the security forces' operation in front the parliament as an "illegal and undemocratic attempt by fascist forces... to force a change in the Nigerian Senate's leadership." The former military ruler is under pressure for his handling of rising farmer-herder violence which has claimed at least 1,300 lives since January. He also faces criticism over the military's ongoing campaign against Boko Haram militants.